One of my favourite social network applications (if it can be called that) is Paper.li. Paper.li is not really a social network but an aggregater, running across your twitter contacts and serving up a daily newspaper type summary. How the algorithm works is not transparent. But given I have no time to read every Tweet I receive it fulfils a purpose – at least for me. Two stories in my feed – rather feebly entitled the Graham Attwell Daily – struck my attention today. One is a link to a longish report by the Pew Internet Center on ‘The Fate of Online Trust in the Next Decade‘. I am saving that one to read and comment on tomorrow. [F]or some popular product categories, such as Bluetooth headphones and speakers, the vast majority of reviews appear to violate Amazon’s prohibition on paid reviews . . . I use reviews a lot for booking hotels and finding restaurants. And I find my trust in these reviews is sinking fast. I am not sure how much it is due to people deliberately gaming the system. I think a lot of it may be due to the very different desires and perceptions of people when they go out for a meal. 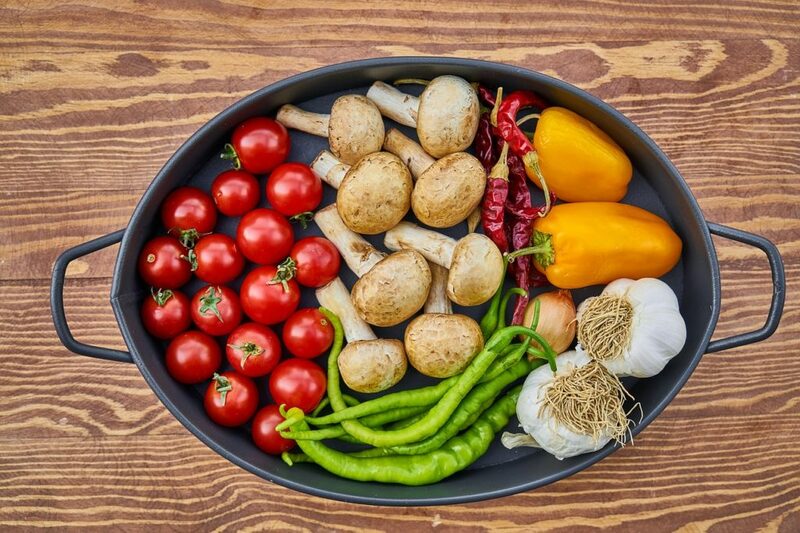 Different people look fro different things from a meal out, like different food and different environments. My very unscientific research shows quite pronounced differences in restaurant reviews on Trip Adviser between people from different countries, and from tourists and local residents. I have resorted to the old way of finding somewhere to eat – to walk around, to look in the window and look in the window. And I am much more likely to trust recommendations from friends than from Trip Adviser, Yelp, Google or teh like. I am not sure what if any implications for the Fate of Online Trust in the next decade. But it probably means something. A major topic for all groups working with the theme “Social Media” was the relevance of Facebook and the challenge to get everyone working with Facebook. In most groups the tutors from Bau-ABC were hosting facebook-groups for their trade and the apprentices were actively involved as contributors and readers. However, the groups served more as means for image-creation, enhancing the occupational/ professional identity of apprentices and demonstrating their learning achievements. Indeed, some of the groups were using a lot of photos and videos, but these were not primarily used to support learning. Yet, altogether, these groups played a role in the occupational/professional socialisation of apprentices and in enhancing their occupational/ professional identity. From this perspective Bau-ABC promoted the use of Facebook via its own Facebook site and via these trade-specific Bau-ABC Facebook groups. Having said that, it is worthwhile to note that not all training staff was in favour of using Facebook in such a way or getting Facebook accounts for themselves. Here, we can see several reasons that are linked to data privacy, data management and commercial use of data submitted by individual users. However, it was acknowledged by the participants that the exisiting Facebook groups of Bau-ABC have played a positive role. Moreover, it was recognised that Facebook is the most popular social network used by apprentices and young people in general. Therefore, it makes sense to get familiarised with social media by working with Facebook. Most of the participants had their own (private) accounts or were owners of the FB-group accounts. For those who didn’t have accounts we had a group account for learning purposes. Thus, they could also participate in hands-on exercises. These exercises were slightly different in the five groups. Yet, they served the purpose to get all participants use a Facebook-account to post, comment and communicate and to share information on events of interest. Some groups put more attention on settings and privacy issues, some more on sharing between individual users and groups. Altogether, these exercised helped to overcome the gap between users and non-users. Some of the hitherto non-users became active users due to positive learning experience in the workshop session. However, the aim of the training was not to give all attention to Facebook but to get an insight into a wider range of social media and their potential uses in the context of apprentice training. For this purpose the workshops gave a quite some time for brainstorming and mapping trainers’ experiences on different media. Accordingly, we had some demonstrations on the use of Twitter (less used by trainers and apprentices) and on the use of hashtags (#) to mark search categories and tags. In a similar way we explored YouTube channels and use of YouTube videos in training and in multimedia training. Finally, after exploring different social media, the participants were invited to fill a table in which they indicated their priorities among social media and for what purposes and for with which target groups they use these. In this way the participants were working towards their personal ‘portfolios’ of social media. I think this is enough of this theme, for which we dedicated two workshop sessions. Two other workshop sessions focused on the theme ‘Preparing Digital Learning Materials’. Together with my colleagues, Christine Kunzmann, Andreas P. Schmidt, Graham Attwell1, Elizabeth Chan2, Marius Heinemann-Grüder, Jenny Hughes, Wenlin Lan2, Andreas Vratny and Andreas Heberle, we have produced a short paper for the forthcoming ARTEL workshop on Awareness and Reflection in Technology-Enhanced Learning at the ECTEL conference. The paper explains the thinking behind the Reflect App which we hope to launch as a Beta next week. REFLECT is a mobile app that promotes a regular reflective routine. It is voice-based so that it can be used, e.g., while driving a car or in similar situations. The reflection session is scaffolded through decks of questions that can be configured by the other and shared with others, who in turn can reuse the questions. Reflective learning is seen as one of the key activity for workplace learning that is most neglected because of time pressure in everyday business. This particularly ap- plies to General Practitioners (GPs) who are on a tight schedule between slots for consultation and home visits. From the need to make learning activities traceable for re-certification, there is, however, an interest from doctors to reflect on learning experiences and to follow-up on learning opportunities arising from everyday practice. Key approach is to create reflection opportunities by utilizing time slots like when driving in the car from/to a home visit, o r commuting. The key idea behind REFLECT is that reflection support is based on voice interactions, which allows for hands-free operation. Users can record their reflection sessions, and the system transcribes it and sends it to them via e-mail for further processing, e.g., for including in a personal note-taking or task management tool, or a personal portfolio for future reference. But reflection also needs scaffolding, particularly if it is supposed to take place embedded into working processes like in between home visits. This is achieved through recording the reflection session in the form of a structured interview along a deck of questions. 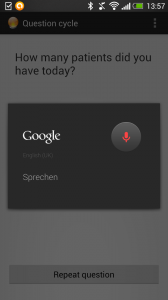 The app reads the question (via text-to- speech) and then records the user’s responses. Via special voice commands (e.g., “next question”), the user can skip questions. Useful questions for reflection cannot be pre- defined by the app designer, as they are situation- dependent (reflecting on the day/last patient, reflection on a longer period of time, reflecting after a training session) and there is no general knowledge about (i) which situations are relevant, and (ii) which questions are useful for which type of user. Therefore the app is complemented by a web-based interface that allows for choosing decks of questions that have been shared by others, for rating their usefulness, and – as soon as the learning becomes more confident and experienced in reflective practice to define own new questions and to share them with others. This results in a lightweight and community-driven approach to scaffolding reflection, which also provides the opportunity for maturing the collective knowledge how to best structure such reflection sessions. The system consists of an app to be installed on a smartphone or tablet (the current version requires Android 4.1 or higher – other systems are planned), and a web-based backend. The app allows for choosing a deck of questions, reads the questions to the user and transcribes the responses of the user and reacts voice commands. Towards that end, the Google Text-to-Speech and Speech-to-Text APIs are used. While this voice recognition does not deliver 100% accuracy, first tests have shown that under realistic conditions (e.g., in a car) the system produces a sufficient of quality of the resulting transcript to be useful for the user. 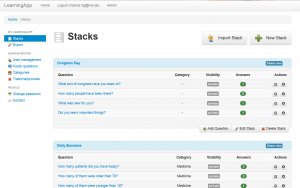 The backend is based on PHP, and users the Bootstrap framework. 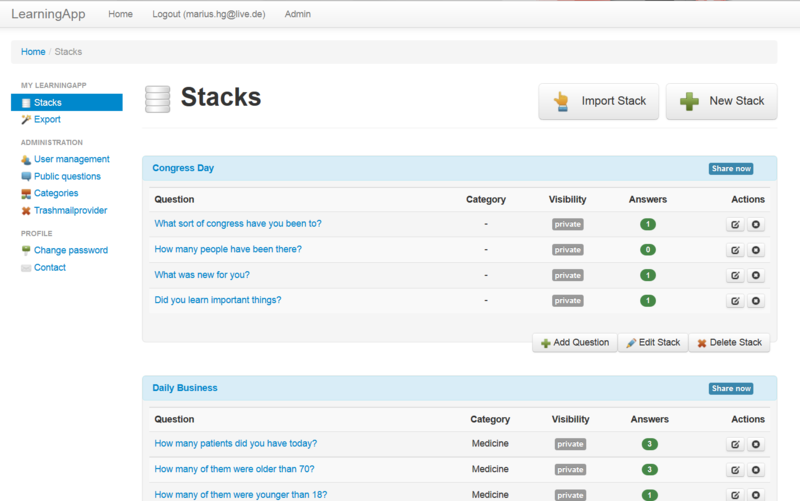 It gives the user the possibility to configure decks of questions, share them with others, use shared questions from others and rate them. The app will be available from the Google Play Store and from the Pontydysgu website. As part of the Learning Layers project, this app is planned to be evaluated with a larger number of users as part of General Practitioners’ everyday work practice. Further- more, it is planned to complement the Android app with an iOS solution to cover the different types of smartphones used by the target group. The ever resourceful Leon Cynch has announced that L4LTV will be launching at end of Sept 2013. he says it will be an online niche TV Channel broadcasting fortnightly for six months in the first instance. There are plans to fund the channel through KickStarter campaign coming soon! There have been many discussions in the educational technology community about recommender systems. And there have been a number of projects attempting to develop systems to allow people to recommend or verify the skills and competences of other people. Now Linkedin has jumped big time into this area. In fact Linkedin has long had a system for allowing people to provide a reference or recommendation for others. I wrote a recommendation for Josie Fraser for her work for Jisc as a ‘community architect’. But whilst some people – like Josie – have been fairly diligent in seeking recommendations, I suspect most people have never bothered. And the old recommendation system required some effort on the part of the person writing the reference. Writing more than 148 characters has long gone out of fashion in the days of Twitter and the Facebook like button. 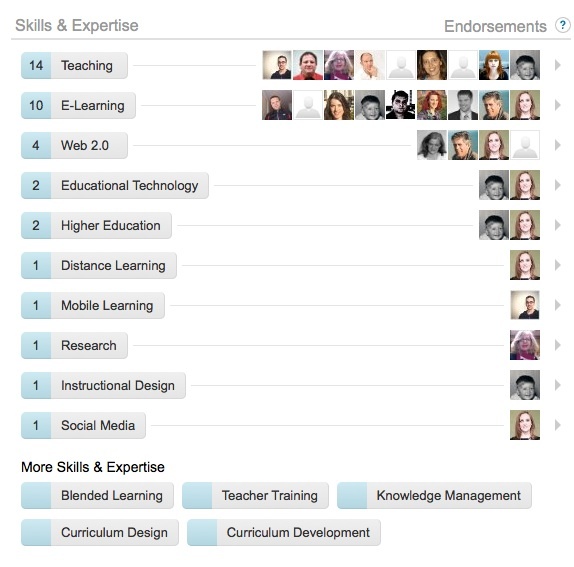 So Linkedin have launched a new system to allow you to ‘endorse’ people. As far as I know, they have not published how it works. But it seems to be based on matching your self claimed skills and competences to others in your network and then asking them to endorse you. It is an interesting development but I have serious doubts about its credibility. Will employers take such a one click system seriously, especially given that there is no requirement for you to actually know the prso0n you are endorsi9ng or to have any real expertise for whatever you are endorsing them? Or will we all end up trying to game the system to make our endorsements look more impressive? Some years ago, the UK government decided that one way to increase peoples’ employability was to send unemployed people on a CV writing course and to help them produce a professional looking CV. The result of course was CV inflation with everyone havi8ng a great CV regardless of their real abilities to do a job. And I suspect that is what will happen with Linkedin endorsements. We will all end up endorsing each other and end up where we started. Anyway I’m off now to endorse some of my friends. RadioActive Europe project which will work with different groups of young people and adults to develop internet radio and set up a European Internet Radio hub kicks off in November. But we are already working on a RadioActive project in London, funded by the Nominet Trust and I am in contact with a number of projects and initiatives around Europe using using radio and video channels with young people and adults. One of the biggest problems for these project is music. Well it isn’t music as such that is the problem. Access to music has never been easier. I am nostalgic for those long hours I spent browsing in record shops, and taking hard choices as to which album to spend my hard earned pennies on. Now my phone has more music than was ever contained in my much loved collection of LPs. The problem is the licensing of commercial music for streaming over the radio or for use in downloads of radio programmes. And of course many young people want to play their favourite music. It is a form of curation and self expression. From talking to many musicians, they too want their music to be played on internet radio. It is a way of reaching new audiences who might buy their music. But the licensing, controlled essentially by the music industry (and certainly not the musicians) is a total mess. I ploughed through the UK licensing documents last week to try to make some sense out of what we can and can’t do through RadioActive. And this is what I came up with. b) A PRS For Music licence and a PPL licence. 1. We cannot offer the download of programmes or files containing any part of any Sound Recordings. This includes Podcasting. 2. We cannot loop the (streamed) replay within a 3 hour time period. Assuming – reasonably I think – that we do not go over 270000 performances per year the 2012 licence fee for PPL’s Small Webcaster Licence is £189.41 (plus VAT). If we played say 8 recordings per hour this would provide us with 649 listener hours per week. We would have to provide quarterly a Webcasting Report detailing the total number of Listener Hours (i.e. the aggregate duration that all users have streamed the service), and the average number of Sound Recordings played per hour for the quarter and (if they ask for it) – a Programme Report detailing all of the Sound Recordings used during a given day’s programming. We also need to know which countries listeners come from (via web analytics). The PRS license is far less restrictive costing £118 for 118000 streams. it also allows downloading. How could that work? For instance cover versions of copyrighted music can be downloaded but commercial recordings cannot. It is all a bit of a nightmare. Jamendo.com is an increasingly rich source of Creative Commons licensed music (although I am told even this is contested in Portugal). And I hope through the RadioActive projects that we can start recording original music. But themess of licensing is stigling creativity and preventing many musicians from getting their music held. All this in the name of an industry which has spectacularly failed to keep pace with changing technologies and changes in the social ways in which we listen to and share music. A geeky article in GeekWire notes that Facebook has downplayed the possibilities of future income from their mobile app. the reason being suggested in that users don’t like mobile apps. I think they are right. I have installed several apps because of the advertising. And although I have pop ups blocked, I use search engines everyday on my desktop computer which provide advertising. The truth is I never see it. But on a mobile it is pretty hard to avoid. This has some pretty big implications, considering that the whole Web 2 and social software thing has been largely been financed by advertising. A move back to paid for software and services could be a good thing. It is near to impossible for start up companies or small enterprises with a smart idea to develop a business plan. Indeed, most developers I have talked to just hope that their idea will catch on and one of the big companions will buy them. This doesn’t do much for innovation. Indeed big companies have a generally poor record when it comes to taking over innovatory start ups. Yahoo have managed somehow to run Flickr, perhaps the first really social application, into the ground. Google ended up closing down microblogging service Jaiku and I don’t hold any great hopes for the future of Posterous under Google stewardship. Not only would a return to paid for applications and services allow a better chance for innovative start-ups to compete and to develop business models which allowed them to remain independent but it could allow the development of better privacy controls and quality. The argument that because a service if free, users have no rights is insidious, but without proper regulation is hard to counter. And finally, it might get rid of all the advertising spam which pollutes the web. Amy Gahran has written an interesting article on the slow take off of QR codes. She quotes research by Archrival, a research group that focuses on youth marketing, which surveyed 500 students at 24 colleges and universities across the United States who “found that although about 80% of students owned a smartphone and had previously seen a QR code, only about 20% were able to successfully scan the example QR code they were shown. One of the reasons advanced for the findings was that the process of accessing QR codes is too clunky and time consuming. So far I agree. Firing up the app and getting it to scan can be a pain. On the contrary I suspect it is just because QR codes are becoming associated with brands and products that we are reluctant to use them. In this respect context is critical. I will not use a QR code just to access some random brand or product web site. On the other hand if the code does something useful (and I know it is going to do something useful) like tell me the time of the next rain or bus or allow me to check in for my flight then I will and do use QR codes. And even if QR codes are thought to be an interim technology towards augmented reality and near field communication the same issues arise. These findings reflect a growing tension between the development of social networks and services designed for us (the 99 per cent) and those for the one per cent or less of companies wanting to use social networks and advanced technologies for selling brands and products. The problem is that social network and service providers are more concerned with the one per cent than the 99. This has led to Facebook’s constant attempts to erode privacy in order to provide more data for advertisers. Even Twitter, which has perhaps been the most brand free of the networks has launched a re-design which seems primarily intended to facilitate brand advertising. Such tensions will not go away. Web 2.0 was launched on the back of free service paid for by real (or hoped for) advertising revenue. Yet such revenues are finite. Ultimately we need to develop new and more robust business models which better reflect the nature and purpose of the services provided. This does not mean there is no future for QR codes and other augmented mobile applications. There are a number of very convincing experiments of their use in education. But where they do work, in a social sense, the context and purpose is clear. And that is for learning, for interaction for creativity, not for pushing brands and products we do not want.